Exercise can be a powerful promoter of brain health, and improve many markers of cognition including attention and mood. Equally, the power of the mind (attention, motivation, fatigue) can be key determinants of exercise performance. Figure 1. Adults exhibit improvements in mood after exercise. The effect is greater than that obtained through watching videos. 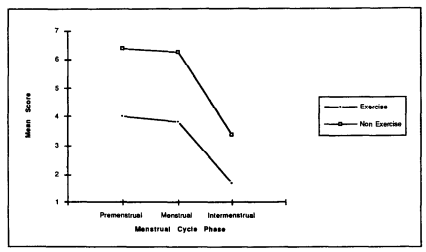 Consistent levels of exercise resulted in improvements in negative mood states (as measured by the menstrual distress questionnaire) across all stages of the menstrual cycle in females. On this chart, lower scores are better (indicating lower levels of self-reported negative mood). 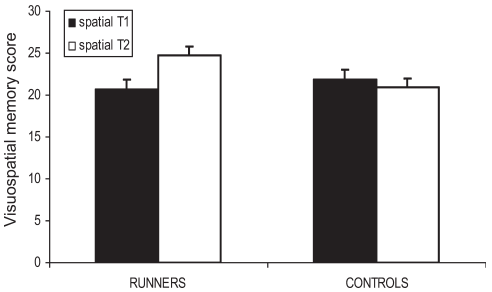 Exercise in the form of running was shown to lead to greater amounts of positive affect (mood) in healthy adults as measured post-training (T2) compared to baseline (T1). 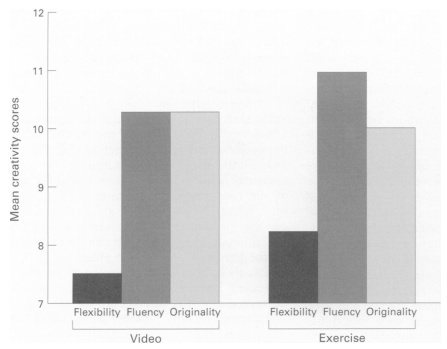 Adults exhibit improvements in creativity after exercise. 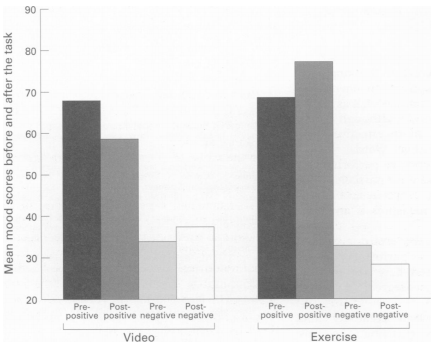 The effect is greater than that obtained through watching videos. Older adults who engaged in physical activity, combined with a high fat/high glycemic index diet, were found to exhibit decreases in beta-amyloid, an inflammatory biomarker that plays a role in mild cognitive impairment (impairments in memory and executive function). Exercise is known to play a role in cognition because it activates molecular signaling cascades. Certain molecules crucial in cognition are found to be modulated by exercise, the most important ones of which are neurotophins. Neurotrophins such as brain derived neurotophic factor (BDNF) and nerve growth factor (NGF) are signaling molecules that are involved in maintaining growth of neurons. The effect of exercise on biomarker levels has been studied widely in animals. In rats, it was found that exercise over a period of 6 weeks led to a significant increase in BDNF levels in the hippocampus compared to intermittent fasting (fasting every other day).5The hippocampus plays a role in regulating both memory and emotion. Steinberg, H., Sykes, E. A., Moss, T., Lowery, S., LeBoutillier, N., & Dewey, A. (1997). Exercise enhances creativity independently of mood. British Journal of Sports Medicine, 31(3), 240-245. Aganoff, J. A., & Boyle, G. J. (1994). Aerobic exercise, mood states and menstrual cycle symptoms. Journal of psychosomatic research, 38(3), 183-192. Stroth, S., Hille, K., Spitzer, M., & Reinhardt, R. (2009). 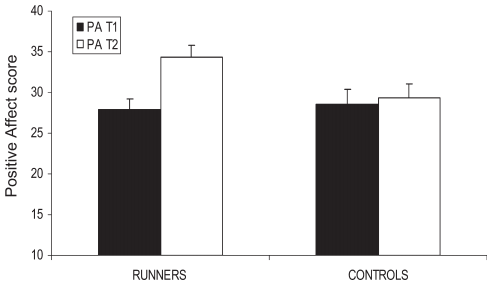 Aerobic endurance exercise benefits memory and affect in young adults. Neuropsychological Rehabilitation, 19(2), 223-243. Baker, L. D., Bayer-Carter, J. L., Skinner, J., Montine, T. J., Cholerton, B. A., Callaghan, M., ... & Lampe, J. (2012). 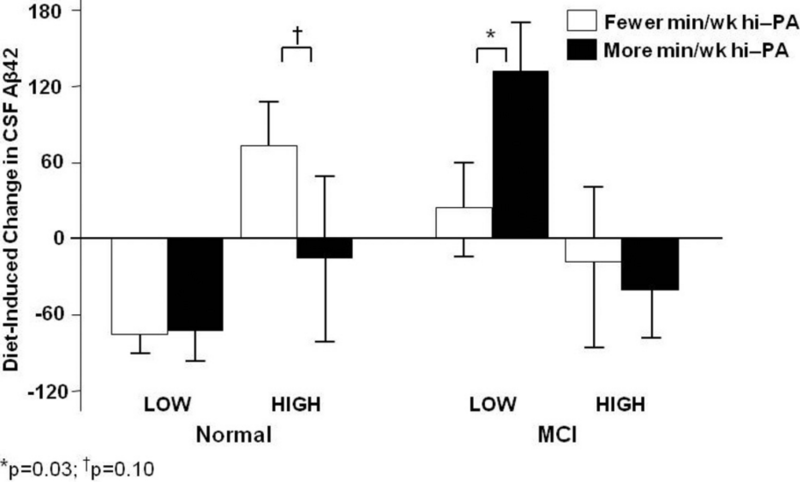 High-intensity physical activity modulates diet effects on cerebrospinal amyloid-β levels in normal aging and mild cognitive impairment. Journal of Alzheimer's Disease, 28(1), 137-146. Bak, A. M., Egefjord, L., Gejl, M., Steffensen, C., Stecher, C. W., Smidt, K., ... & Rungby, J. (2011). Targeting amyloid-beta by glucagon-like peptide-1 (GLP-1) in Alzheimer's disease and diabetes. Expert opinion on therapeutic targets. Li, L. (2007). Is Glucagon-like peptide-1, an agent treating diabetes, a new hope for Alzheimer’s disease?. Neuroscience bulletin, 23(1), 58-65.